I have decided to put all the information regarding the trip on the first post of this thread so potentially interested people can find it all in one spot. Calgary member meet up at Tim Hortons on Nose Hill Drive NW 6:30am for breakfast and await arrival of Edmonton folks. Everyone cruise into Sunshine together leaving Calgary as soon as we're all together and shoot for 8:00am arrival. 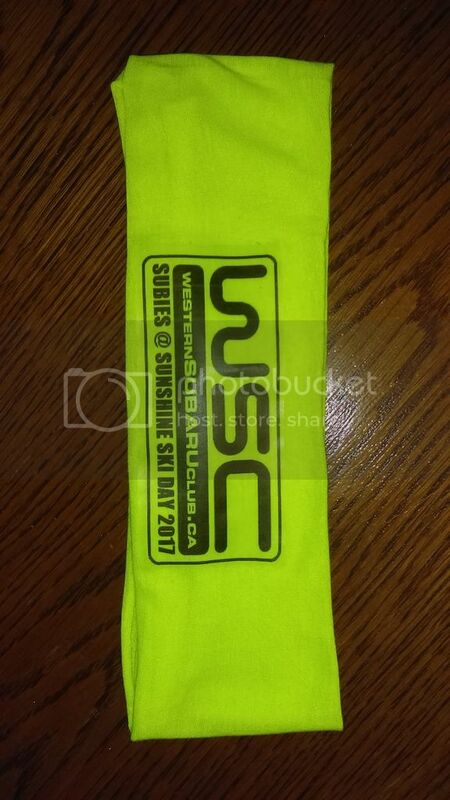 I will hand out personalized buff's as I run into you either at the meet locations or the destination. Have a great time on the slopes, hopefully we get a bunch of good pictures/video and we can do a lunch. When we've all had our fill of skiing those that are sticking around or staying the night can get together for some drinks and reminiscing. Really looking forward to this and hope we can get a nice group of people together for this. I would be down for this! Got a response from Sunshine already! I have attached a pricing guide to help you out. Our minimum for group rates is 15 people. We have several options for group lunches, I have attached the menu to our most popular group lunch. You can also purchase drink tickets or open food vouchers. These will be collected by our staff and you will only be charged based on the amount of tickets received/food and drinks given. We have snowshoeing available for anyone who may not be interested in skiing or snowboarding. There is a hotel up on our mountain as well. There are many places to grab a bite to eat, sit by the fire, and take in the views. We do offer gondola only lift tickets for anyone that would like to go up to our village and hang out in our lodge. We offer bus services if you would like to travel all together and save on some gas. They can pick you up from any address in Calgary, Red Deer, or Edmonton. Please do not hesitate to contact me with any questions or concerns you may have. I hope this helps!" So now we have some options for what we'd like to do, the group rate is not much of a discount than their typical day pass. I do like that they offer some other activities such as snow shoeing which my wife might like as she doesn't ski/board. Will need 15 people to qualify for the group rate. Also I cannot post the PDF's on here as they are over the allowable size limit, I can email them possibly or if a Moderator can grant permission to post them here? 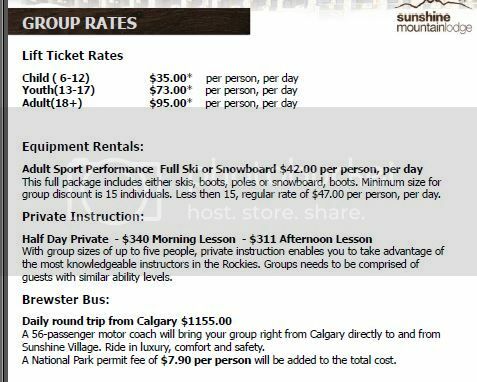 If anybody is interested in just getting cheap passes, if you know somebody who goes to SAIT, you can get full day lift passes for around $65 or $70. What is the discount for a group rate? Take a screenshot/snip and post them as pictures? I will see if they can do any better but I think you can get the Costco one for cheaper than what they are offering. Heck, if someone on here has access to that 65-75 rate for everyone I say we make our own plans. I have asked if they can offer a better price point for the group and compared the day pass price to the group rate and even the individual student rates. It is not that enticing to be honest to go as a group but I will wait until they respond. Seems odd that they would offer such a poor group rate when you could potentially bring in a lot of people who will spend $ at their concessions etc. Thanks for all the legwork Jimpreza111! For anybody who goes often I'd say this is the most feasible option otherwise if you're only going once or twice a year Costco is the way to do it. It looks like the play is to do it separately from their offering. $4 discount? Really? I will likely just buy the Sunshine Marmot card and I assume there will be a few others who will have done this as well. Once we get numbers, I think the best bet would be to see if some of the SAIT (not sure if it's available at NAIT or other colleges/universities around) students to see how many passes they can get and the remainder group up to get the Costco booklets. "The lift tickets to cost less the more you buy. For 15-49 people it is $90, and for 50-249 people it is $86, and if you want to bring more than 250 people we can go from there. Student and Costco lift passes are not sold through our groups department, and they buy in large amount of bulk so they are dealt with differently than our group trips." Don't think we'll round up 250 people, lol. We could hit the $90.00 rate easily enough. As thedude says it might be better to go the Costco or Plus Card route. Personally I have some time off between Christmas and New Years where I could get the use out of the Costco one and still have a pass for this trip left over. Let's start with a date that is workable for everyone interested. Should we do it on a weekend or during the week? Weekends can be pretty busy there but are easier access for working stiffs. I am not opposed to a week day and would just book a day off work. Once we have a time table we can start a head count. Sunshine/Marmot card all the way. Plus u can get direct to lift with it and avoid the ticket lines. Iz beyst bro. After many many years of organizing smaller groups of between 5-30 people, I have come to the conclusion that AMA, student university discounts, and Costco are the ways to go ticket-wise. Let everyone get their own, and just plan the drive there/hangout. I'm willing to help on that if you are interested in extra help. Awesome, I appreciate the offer Markkas! It appears that the best deals to be had are going to be individuals taking care of their own day passes in whichever method they choose. I'm going to post a poll that will gauge participation and offer some optional dates and we'll go with the most popular option. If it's not too much trouble for everyone it would be cool to have a pre-meetup and cruise into Banff/Sunshine together early. Opportunity for group pictures, possibly lunch etc. I would suggest an Edmonton pre-meet approx 30 mins before the scheduled departure time at a tims or similar. Group pictures my be difficult due to the lack of light early in the mornings. Another stop just outside of Calgary (maybe at the Petro Can) would be an easy spot for us to grab all the Calgary Area folk (And they can meet 30 mins before our scheduled arrival time), but ultimately I think any "meets" along the way other than that will be a waste of time. A post-ski group picture would most likely be the best thing to do. We can find a few good areas for a big group photo. Dinner is something that can also be arranged if people are spending the night. I deleted the other topic/poll, please submit your vote here and I'll try to keep everything on one topic. No worries! However, I do have a comment about the poll. I feel like we have enough interest already. 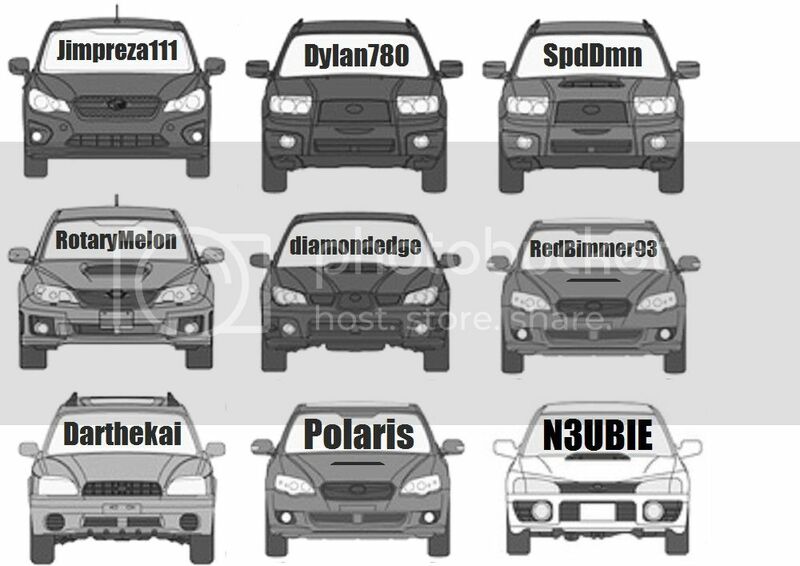 I'd look at a total of 10-15 cars - but either way, numbers will always change very last minute. I think right now we need to focus on a date for the trip. I'd start off with a poll general timelines of when we should go. As mentioned in the other thread, I'm in if it's on a weekend, definite maybe if it's on a weekday. Preference for me would be in the new year as the snow before then can be hit or miss.